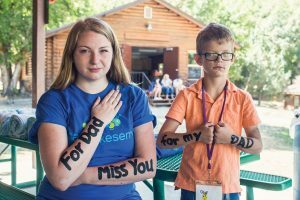 Run by BYU student volunteers, Camp Kesem is a summer camp for children whose parents have suffered from cancer. Nestled between pine- and oak-covered mountains near Tooele, Utah, they play. Cheeks pink, legs dusty, kids and teens 6 to 18 blast Nerf guns in a grassy field. On a wooden stage they dance to peppy summer anthems; at picnic tables they thumb wrestle; in a pool they call out, “Alligator, Alligator, what time is it?” It is, by all appearances, a summer-camp dreamland. Michelle L. Mayer (’20)—known as “Smu” here, where everyone goes by nicknames—poses for a picture with 8-year-old “Wolverine.” The words on their arms combine to read, “For our dads.” They smile for the camera then step away for a silent, tearful hug. Welcome to Camp Kesem, a national organization that provides free summer camps for children whose parents have or have had cancer, run by college-student volunteers. BYU started its chapter in 2008, and Mayer, whose dad died from cancer and who attended UCLA’s camp for eight years, just finished her first year as a counselor. At August’s camp, which drew 134 children and 64 BYU-student volunteers, she worked with the 7- to 9-year-olds, including Wolverine, whose dad died in 2012. Having lost her dad to cancer, Kesem volunteer Keely R. Burnette (’19) works to give kids (like “Olaf,” right) whose parents have cancer a week of fun and a lasting community. Photo by Brad Slade. Counselor Sean D. “Baloo” Allsop (BS ’16), who lost his mom to cancer, has volunteered for four years. “At home [the kids] are stressed and worried, . . . but then they can come here and laugh and smile and play,” he says. In the log-cabin cafeteria at lunchtime, sandwiches, fries, and watermelon are pushed to the side so 9-year-old “Gun Show,” sleeves rolled up, can arm wrestle a counselor. A gathered crowd watching on, Gun Show emerges victorious.